Definition at line 43 of file llnamebox.h. Definition at line 49 of file llnamebox.cpp. 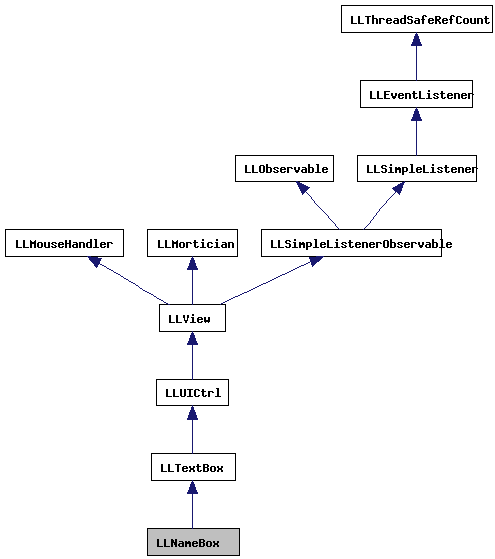 References LLUUID::isNull(), LLStringBase< char >::null, setNameID(), LLTextBox::setText(), and sInstances. Definition at line 64 of file llnamebox.cpp. Definition at line 96 of file llnamebox.cpp. Definition at line 114 of file llnamebox.cpp. Definition at line 69 of file llnamebox.cpp. References DB_FIRST_NAME_BUF_SIZE, DB_GROUP_NAME_BUF_SIZE, DB_LAST_NAME_BUF_SIZE, first, gCacheName, LLCacheName::getGroupName(), LLCacheName::getName(), mNameID, and LLTextBox::setText(). Referenced by LLNameBox(), and LLPanelGroupGeneral::update(). Definition at line 65 of file llnamebox.h. Referenced by refresh(), and setNameID(). Definition at line 62 of file llnamebox.h. 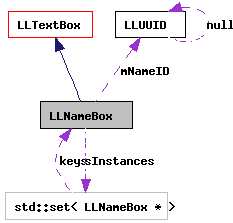 Referenced by LLNameBox(), refreshAll(), and ~LLNameBox().